Welcome to Canada Day. Chasing Ray will have the round-up of blog posts about authors and illustrators from Canada. So many choices! I had way too much fun looking at Ontario Library Association's Canadian Materials Committee's "Best Bets" lists, here for the most recent list. And also browsing the Canadian Children's Book Awards links. The Plot: Cyril is probably the youngest person to attend law school: "I started going to law school when I was ten years old." "I love saying that. I love how people look at me like, this guy must be some kind of genius." But, Cyril isn't a genius. He's the son of a teen mom; a girl who ran away from home, lived on the streets, and grew up as her son grew up. She's only 15 years older than her son. And when his mother couldn't afford a babysitter, Cyril came along to class with her. "You think math class is bad," Cyril says. "Law school is unbelievably boring." But it's thanks to his quasi law school education that Cyril solves the mystery in Quid Pro Quo and saves his mother's life. Cyril's mother, Andrea MacIntyre, is not your typical book mother. Her son may be a teenager, but Andrea is not even thirty. While she is the adult and the mom, she is also angry, passionate, short-tempered, generous, kind, and unable to compromise her beliefs. Maybe because of her own runaway past, she keeps a close eye on Cyril. First, he is dragged along to her law classes; later, when she gets a job, he gets drafted into being a receptionist for the lawyer Cyril's mother works for. When she disappears, Cyril knows that something is up. She wouldn't just disappear. 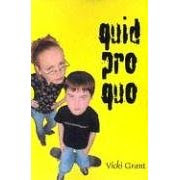 This mystery is less than 180 pages; in a day when it seems too many books are bloated and in need of a good editing, Quid Pro Quo is tightly plotted, with no wasted words. Speaking of words -- each chapter is introduced by a legal term. For example, Chapter 14 is "'In Camera' (Latin) The hearing of a case in private." Also good? As you can see from the excerpts above, Cyril brings the funny. 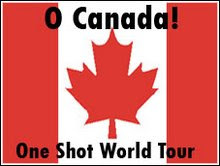 Finally: it's Canada! Seriously. As a former lawyer, I got a kick out of the differences between the American and Canadian legal system, including legal education. Maybe not many readers will notice; maybe they won't realize until they are older that those differences are there. Still, it gives the book a unique Canadian flavor. I'm not surprised to see this is an Orca title; Orca has a great selection of hi-lo books, and even tho this isn't part of the x line, its fast pacing, short chapters, humor, edgy characters and mystery make this a good pick for reluctant readers. 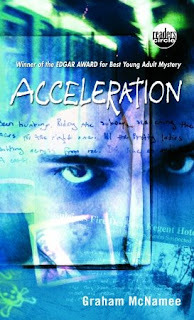 My second mystery book is Acceleration by Graham McNamee. Duncan's summer job seems boring; he's working at the lost and found for the Toronto Transit Authority. OK, it doesn't just seem boring; it actually is boring. There's only so many times you can check out the lost sunglasses, practice with the abandoned golf clubs, read the books. It's the journal of an almost serial killer. The almost killer recounts killing animals and stalking people, looking forward to his first murder. Can Duncan stop a murderer before he kills? Before getting into the mystery part, let me say that this book is also funny. Duncan is now 17; but a few years before he and his friends had the bright idea to steal a toilet. Yes, a toilet; it makes sense to them. It's a fancy expensive house, an expensive toilet... and they underestimate how much it weighs. Or how difficult it will be to move without a car. Most of the humor comes from Duncan and his friends; plus the whole toilet caper adds to the reason why Duncan is reluctant to go to the cops. McNamee does a very believable job of establishing why Duncan ends up going after the killer by himself; he doesn't quite trust the cops (see toilet); and he also doesn't have much to give the cops. When Duncan decides to track down the killer, he searches the journal for clues, does research, trying to figure out which subway or bus line the killer used, trying to figure out who the maybe victim will be to warn them. Along the way, there are serious questions, especially about Duncan's role in this as he becomes a stalker. And what will he be willing to do, should he find the killer who hasn't killed? I enjoyed Acceleration. I haven't read QPQ yet. I haven't read either of the books you reviewed but I'm definitely adding them to my holds list!